If you already own Karma Deck Pro or buy along with this, you will get this ebook for $3 only. This ebook gives you 7 cyclical stacks based on the Karma Deck. The stacks have random sequence of values and suits and it is very easy to know the next card given any card in the stack. Basically the Karma Deck was designed for use as a memorized deck without the sweat of actually memorizing it. One could learn the Karma Deck in 5 minutes and then know which card is in which position and vice versa. The basic principle was simple enough for that and at the same time powerful enough to generate 7 different stacks with the same fundamental principle (Karma Deck Pro). And all this is done without compromising on the randomness of values and suits. 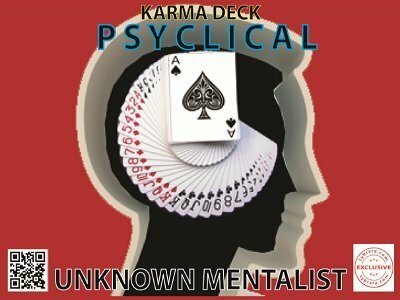 Karma Deck Psyclical has been designed to fulfill a specific need. The need to use the Karma Deck as a simple cyclical stack in which quickly knowing the next card of any given card is enough to create some great stack magic. Mnemonic based stacks like the 8 Kings stack, although have random sequence of values, depend on brute memorization. Algorithm based stacks like the Si Stebbins stack, although no memory required and easy to calculate, are not random enough and the pattern is easily recognizable. Further, in both the above type of stacks, the suit sequence generally used is chased, shocked etc which are red/black alternating patterns. So here is Karma Deck Psyclical which clearly fulfills this particular need. A cyclical stack with random values and suits but without the sweat of memory work. And without using the regular chased, shocked etc suit systems. An easy method for knowing the next card given any card in the stack is explained. Also included are 3 killer routines with a mentalism flavor. 1st edition 2016, 20 pages. What can I say, This is an ebook worth having along with all the other Karma Deck material. This is a simple way to know the suit and value of any card in the deck. I give the UNKNOWN MENTALIST another 20+ rating with this!!! Well done my friend. One more round of applause to the UNKNOWN MENTALIST! Stars for rating may get exhausted but the value of Karma Deck seems to be inexhaustible. Psyclical is one more gem in the Karma Deck series. A super cool and easy method combined with some powerful routines makes this an invaluable offering for a stack magician. I could get the method in just a few minutes - just a matter of running it over in my mind a couple of times and that's it. I am happy to be witnessing the fantastic blooming of this extraordinary Karma Deck series. No stack magic enthusiast or practitioner can afford to miss this. I am amazed and speechless! With Psyclical, I think Karma Deck becomes the ONLY stack which can be used both as a memorized deck as well as a cyclical stack and still maintains random values and suits - that too with 7 different stacks. IMHO, this is absolutely unbeatable. No other stack can offer so much - I'm pretty sure. All this without any memory work. There is no problem even if I do not perform stack magic regularly. Truly ideal benefits. Planning to pick up Deckcelence & Amazers soon. The routines in Psyclical as well as Karma Deck Pro are fab and solid. This whole set along with some of my own routines should give me a lifetime of stack magic. Incredible! To me the Karma Deck system seems like a deep diamond mine - the more you dig the more gems seem to come out. I have them all - Karma Deck, Pro, Kommando Kard, Deckcelence, Amazers - and what a great investment this has been. The 'Psyclical' idea is fantastic - simple and effective and more importantly - very easy. The 3 routines included are superb - again very simple with high impact. I am really enjoying this 'Karma Deck' journey. The Deck That simply continues to grow in size with more routines from it creative thinker and creator The Unknown Mentalist. Who is still one of the newest writers I follow with great interest and pride.